I love pasta. It has nothing to do with the fact that I'm Italian. (Spoiler: I'm not Italian at all.) It has nothing to do with the fact that I'm masterful when it comes to marrying two flavors in perfect harmony and tossing them carelessly over penne. I'm really not. It has everything to do with the fact that I'm on a budget and pasta is the cheapest food ever. I'm in my early 20s and I honestly don't know anyone who doesn't cook pasta at least once a week because they're ballin' on a budget. Stop your spontaneous trips to Olive Garden's soup, salad and breadsticks mecca. Grab your box of Barilla, or your white pasta substitute and get ready to hack your pasta dinner. What's the best way to make your pasta a more well-rounded meal? Adding vegetables. It makes it healthier and more filling. What I'm suggesting is your boil them in the same pot as your pasta. I don't have a dishwasher so I like to use a few dishes as humanly possible. I know you think boiling them together is going to be weird, like going bowling with your ex or blowing up balloons for a child's birthday party, but it'll be fine, I promise. This is a personal favorite. Buy ramen and make the noodles as you normal would, without adding the flavor packet. While you're doing this, fry or soft boil an egg. Then, drain all the water from the ramen and add the flavoring, a spoonful of peanut butter and a little chili or hot sauce. Stir the noodles up, put the egg on top and it's a dry ramen bowl. That's a thing, I promise. God, it's such a good thing. 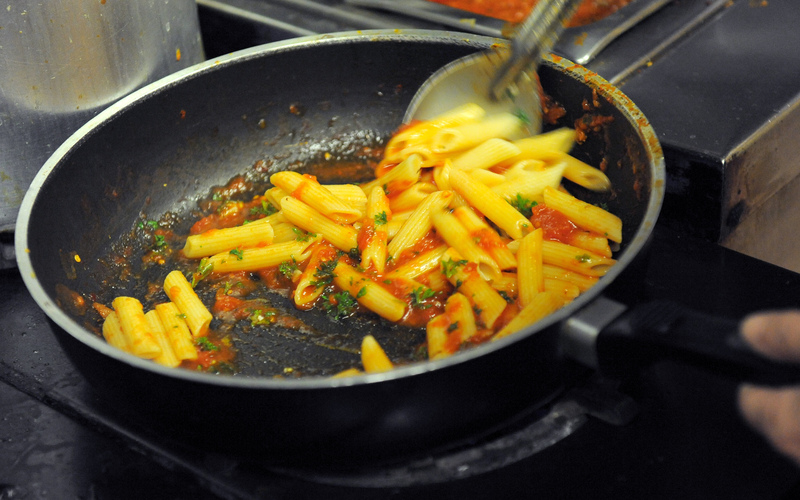 Instead of using a jar of sauce, spend that money on 2 ingredients that will jazz up your pasta. (For me, it's usually fresh tomatoes and a little garlic, which you can measure at the grocery store to make sure it's cheap.) Toss your pasta in oil, instead of sauce, and add your 2 ingredients. Bam! That's what cooking people say when they do a good thing: "Bam!" If these pasta hacks are a little too crazy for you (and let's be honest, they're not for the faint of heart), I also pulled a few of my favorite quick and easy pasta dishes. They all take between 10-20 minutes and won't break the bank. Bless you, Ella Claire, for bringing us a pasta dish that we can make in the microwave in 10 minutes and that is most importantly, cheese based. When I made this, I was trying my very best to not go to the store, so I subbed the sausage for pre-cooked kielbasa and used the shredded mozzarella sitting in my fridge instead of romano. Still fabulous. I'm obsessed with dishes for one. I don't care how Bridget Jones' Diary that sounds, it's the truth. It's so much simpler when a recipe breaks down a meal just for you, because then you're not stuck trying to divide every ingredient by 1/8. I like this recipe because it actually utilizes the frozen shrimp you bought 2 months ago to be healthy and classy and then never actually used. This is my own creation, but stick with me. One of my go-to easy dinners is breakfast for dinner, which is a fancy way to say I make breakfast sandwiches about 3 times a week. Buy the same ingredients (bacon and egg) and then cook the bacon, chopped it up and toss it with your pasta and some olive oil. Fry an egg to put on top. Trust me, it's amazing.